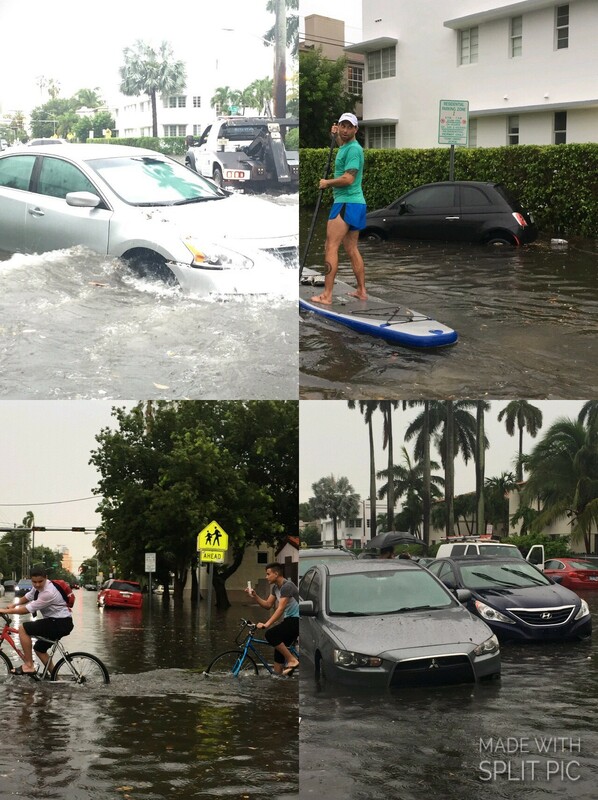 Miami Beach residents are learning the limitations of the new stormwater pumps installed to help the City battle sea level rise. An heavy storm on the heels of Tropical Storm Emily today dished out a rainfall more intense than the new systems could handle. Roads were blocked by water and then by abandoned cars as drivers left their waterlogged vehicles. 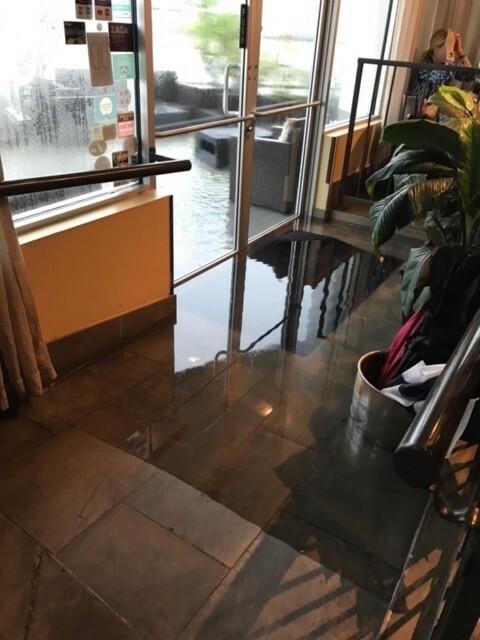 Businesses on Washington Avenue posted photos on Facebook of flooding in their shops and Sardinia, the Sunset Harbour restaurant that has experienced flooding in the past, once again, had water coming through its doors. Above: Sardinia, Sunset Harbour, August 1, 2017. Courtesy Tony Gallo. “Flooding conditions have been experienced in various parts of the City as a result of remnants of Tropical Storm Emily. Based on the City of Miami Beach weather station located at City Hall, 6.11 inches of rain fell in the period of two hours between 2:30 pm and 4:30 pm. The total rainfall is more than 6.5 inches in three hours and experienced peak intensities of more than 7 inches per hour. “The new stormwater systems that have been installed in approximately 15% of the City are designed to handle a 7.5 inch rainfall event with a peak intensity of just under 3 inches per hour. This event was significantly higher in intensity than our system is designed to handle and as a result we saw many areas with significant flooding. In the areas where the new stormwater systems were installed the streets were clear of water shortly after the rain stopped. The areas of the City that do not have new systems in place are still experiencing flooding hours after the event. “Another issue that compounded the situation is the power outage that was experienced in several areas. The Sunset Harbour area for example experienced an outage for approximately 45 minutes. The pumps were struggling to keep up with the rainfall already and when the power went out the impacts increased quickly. Once the power returned and the rain slowed to within the design parameters the pumps caught up. Most businesses in the area were back operating within an hour after the event where in the past this may have shut them down for days. Scenes from South Beach, below. Mayor Levine wants emergency generators for storm pumps now!